College students celebrate their last days of school in the sun with beer much to the chagrin of older residents. Duran, a student at Parsons New School for Design, along with her three roommates, are caught in a war between rent-stabilized residents at Stuyvesant Town/Peter Cooper Village and college students. Tensions began in the 60-year-old red-brick residential complex, in the heart of Manhattan’s East Village, when management began adding wall-dividers in 2007 to allow large groups of students into the complex. Financial overseer CW Capital and Rose Associates management are now marketing the 11,000-units to students with the promise of safety, convenience and pressurized walls, which can turn any one-bedroom apartment into three. “We paid about $3,000 for a contractor to divide the apartment,” said Nadia Zuban, 22, a student at Fashion Institute of Technology who moved into Peter Cooper Village in January and hired one of the three contractors recommended by management. A standard one-bedroom apartment, which usually costs about $3,400 a month, is completely painted white with wooden floors, a small dining room and kitchen at the entranceway. A squared alcove connects the living room and dining room, and in the corner a narrow hallway leads to the master bedroom. But, a student one-bedroom apartment is divided from the dining room across the living room up to the master bedroom by a wall. Zuban, like other aspiring tenants, were told that they can move into a flexi-one-bedroom apartment or have their one-bedroom converted to fit three roommates by Stuyvesant Town and Peter Cooper Village’s leasing office. Joe DePiasco, spokesman for Stuyvesant Town, said, in response to an email question, that the complex is no longer allowing the construction of these non-structural walls. Even though management says its stopped separating the units, long time residents are unhappy with the behavior of many of the complex’s newer occupants. Social worker Jane Holland says that the atmosphere of Stuyvesant Town now resembles a dormitory with excessive drunkenness and noise. 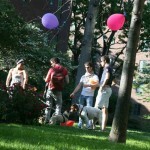 Residents are striking back with its Tenant Association, a representative group which has called for several fire code investigations, more security control of drunkenness, and more support for residents to own their apartments in order to maintain a family environment. A small war is brewing in the housing development because many residents believe that dormitory life cannot coexist with residential family life. Tolerance of college students reached its limit a year ago after Jim Flanagan, an 80-year-old resident that has lived in Stuyvesant town for 30 years, found a drunken student passed out in front of his 11th- floor apartment door. Flanagan knew that the young man lived on the 10th floor of his building, but still escorted the student outside and told him to have someone else let him back in. “They put like four or five people in a one-bedroom apartment, and then they move out in one semester,” said Flanagan. Students like, David Keltz, 22. have felt the wrath of older residents when a 60-year-old woman yelled at him for talking on his cell phone while walking along the grass one afternoon this month. Stuyvesant town is mostly a rent-stabilized multi-building apartment complex, with some residents paying as little as $1,200 a month for a two-bedroom apartment. But tenants, like Holland, say, management has increased the amount of student leasing to help increase rent for individual units. The Tenants Association is trying to help rent-stabilized tenants take control of their residential environment by advocating for the conversion of apartments into condominiums. “We will be able to set rules for ourselves about leasing to prevent a dormitory like environment that is detrimental to the quiet enjoyment of our homes and the long-term stability of our community,” stated the Tenant Association in a February press release on condominium conversion. 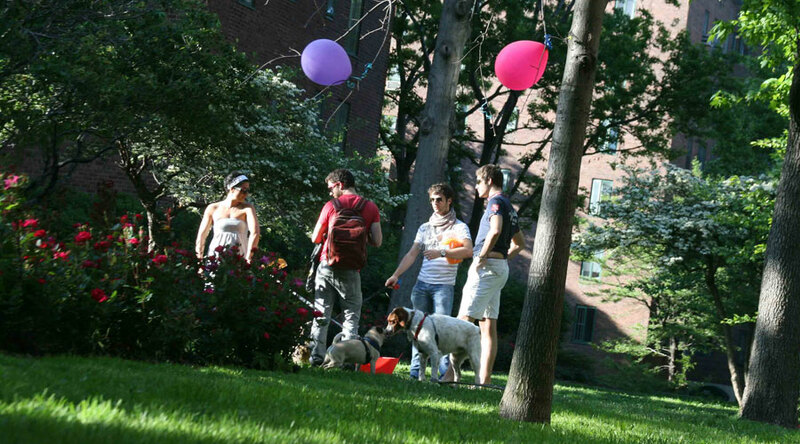 Until the Tenants Association is able to purchase Stuyvesant Town, maintaining the residential environment is in the hands of CW Capital and Rose Associates management. An apartment conversion bid will not be made until the summer after CW Capital places a value on the residential complex, says congressman Daniel Garodnick a longtime resident of Peter Cooper Village. While many rent stabilized residents are not happy with this open door policy, students argue that they can coexist with families despite snarky notes, like the one Duran saw in her apartment, posted throughout the residential buildings. In Duran’s two-bedroom apartment, each roommate shares a room, splitting the $4,000 rent, four ways. The apartment within Stuyvesant Town was the perfect place to enjoy the freedom of renting an apartment with no dormitory restrictions, like having friends visit and sleepover, says Duran. But Duran got more than what she bargained for: countless noise complaints. She and many of the other college students that live in the complex have received a barrage of protests from the sound of a broomstick slamming against the ceiling of her downstairs neighbor for wearing high-heels to residential security guards knocking at the door during small parties. Some students, like Eric Feuster, 20, another student from Parsons along with his roommates, were even warned by security, on several occasions, that if they continue to disturb their neighbors with parties and drunkenness they would receive a $300 fine for every security visit. For Duran, the note on the garbage disposal door was the last straw: she says she is likely not to sign another one-year lease, even if management lets her.